How High is High in Dubai? 818 metres ! on Thursday, 05 February 2009. There’s something frightening, to me at least, about Dubai’s latest construction marvel, the world’s tallest tower, as it inches ever closer to heaven, just a kilometer or two from where I now live. I see it daily, from various different perspectives: telescopic-like layers of concrete, rebar, steel, glass and aluminium, the apex of which pierces the sky impossbly higher than any of its dwarfed neighbours. Photographer David Hobcote (who took this fantastic image from a helicopter in August 2008, and kindly gave me permission to share it with you), assures me there's been no tinkering with this particular shot. Two years ago I jumped out of plane to raise money for breast cancer. 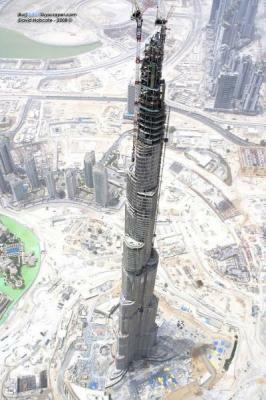 But you couldn’t pay me enough to go to the top of the Burj Dubai - no way! They say you can easily see the spire from 60 miles (95km) away – and that’s really where I’d rather be, at a safe distance thank you very much. Wanda, I can’t tell you for sure whether or not the other photos you sent are fakes. I haven’t, nor will I be, checking out their veracity for myself. What I can tell you for sure is that the recession rumour mill is churning out all manner of tales of woe, leaving everyone in doubt as to if and when the Burj Dubai (the budget for which is purported to be USD 1 billion), and other burj projects (burj is the Arabic word for tower), will be completed. The Dubai government and its visionary leadership continue to put on a brave face while they shore up the local banking sector and reassure skittish members of the expatriate business community, some of whom, by some accounts, are jumping what appears to be a sinking ship like so many rats. Scores who have bought into the Dubai real estate dream are banking on ‘happily ever after’ not turning into disaster, as it seems to have done the world over in the last year or so. Whether the whole thing will implode (or explode), leaving investors holding the proverbial bag remains to be seen. Time, as they say, will tell. Well, perhaps the time has come...and although the bubble may not have completely burst, it has certainly been deflated by several orders of magnitude. I’m not an economist or a financier. Truth be told, I’m not even a particularly good businesswoman. All I can really do is share my personal experience and observations, and let you draw your own conclusions. I’ve run my own moderately successful one-women training consultancy for 10 years. This is the first time since I established the business that I find myself with a virtually empty order book. All four of my “anchor” clients have said they won’t have me run any workshops until at least the third quarter of this year. Future bookings, they all say, will depend on what happens in the next six months. When I returned to Dubai in September after a two-month stay in Canada, I was hoping to buy a two-bedroom flat, having been evicted in July from the small townhouse in which I’d lived for three years (it was being demolished to make room for yet another mega development). In September, two-bedroom flats and real estate agents were as scarce as hen’s teeth. The tables have certainly turned. Four months ago I couldn’t get an agent to return my calls, they were all too busy with existing clients who had a lot more money I. Four months ago, there was hardly a property to be had in Dubai, at any price. Now, I get a weekly list of available properties from one of several agents who are soliciting my custom. Each week the list of properties gets longer, and the prices drop further. I thank God I didn’t buy anything in September; they say price levels have fallen by 20 to 30 per cent since then. As you may or may not know, Dubai’s construction boom (now possibly gone bust), uses a huge proportion of the world’s construction cranes. The 15 to 30 per cent figures that have been bandied about for years are wildly exaggerated says a May 2008 article in the Wall Street Journal (worth a read if you’re a stats fanatic). It could be a case of Chinese whispers or rumour gone awry, as in the saga of abandoned cars at the airport. Regardless of the percentage, many cranes sit atop many under-construction burjs and buildings in Dubai – I’ve seen them with my own eyes. However, in a recent walk along Sheikh Zayed Road, one of Dubai’s main thoroughfares, I counted only one of about 20 actually in motion. The rest stood idle, looking strangely forlorn against a milky desert sky. And where were the usual armies of workers? There was nary a hard hat in sight. Hmmmmm. Does all of this herald the imminent demise of the Dubai dream? I think not. I certainly hope not. Of course there are those who love to see a giant fall. I’m not one of them. I think it’s important to reach for the stars, as individuals, as nations and as a species for that matter. I may find the Burj Dubai frightening, but I applaud that for which it stands in all its awesome magnificence. I admire the guts, the vision, the sheer audacity of those who dare to dream big, and then to try to realize their dreams. And if they do fall, so what? What’s 818 meters when the sky’s the limit? Knowing the spirit here in Dubai, I think a tumble, even from great heights, will be only a minor setback. They will dust themselves off, as we all must, and start over again. Because the glory is as much in the trying as it is in the achieving.